While many people drift aimlessly through life, those who discover their passion and sense of purpose bring an undeniable vitality and energy to their work and the people around them. Enduring limb loss, especially when it happens suddenly, can throw a person off course from his or her dreams and goals, but many people with limb loss prove that this doesn’t have to be a permanent state. Many people have even found that in losing a limb or having a limb difference, they actually gained something else—a desire to live life to the fullest. It’s been seen time and time again that people who have endured hardship can be effective leaders who inspire and remind others that where there is a will, there’s a way. Vasu Sojitra. Image by Seth Langbauer Photography. Those who have passion often have a desire to change the world for the better. 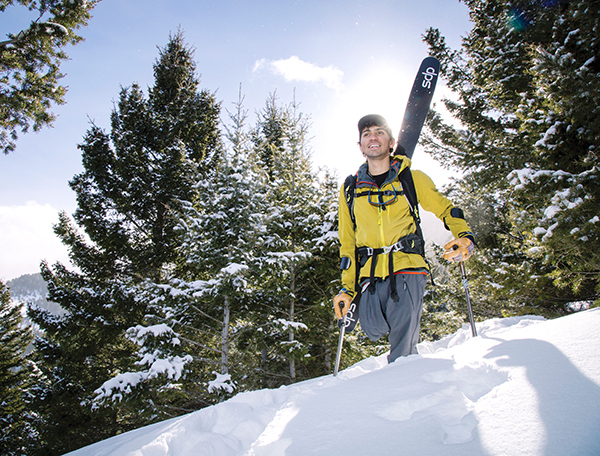 This is certainly the case for Vasu Sojitra, an adaptive backcountry skier whose passion extends to making the outdoors a more inclusive place for people of color and people with disabilities. Sojitra’s right leg was amputated when he contracted septicemia at nine months old. Although he was born in the United States, his family briefly moved back to India, where he witnessed extreme poverty. Prosthetic care was a continuous bur- den there, so his parents returned to Connecticut where he could have better opportunities. Throughout his childhood, Sojitra’s brother motivated him to become fully independent, pushing him to try activities that were out of his comfort zone, including skiing. It happened that at age 10, the first day he hit the slopes, there was another lower-limb amputee there, which catalyzed his passion. Growing up, Sojitra struggled with loneliness and lack of acceptance by his peers, but by his sophomore year in high school, he had formed a community around skiing and began to make lasting friendships with others who shared his enthusiasm for the sport. By college, he became curious about backcountry skiing, and his friends helped him create adaptive equipment, such as fashioning touring skins for his skis and adding a snowshoe extender to the bottom of the outriggers, the poles that adaptive skiers use. In other sports, it was difficult for him to keep up with his friends, but with tailored adaptive equipment he could enjoy all that backcountry skiing has to offer. Eventually, Sojitra moved to Bozeman, Montana, which is a huge hub for outdoor sports, including backcountry skiing, and he took a job working as the adaptive sports director at Eagle Mount, a center that hosts a variety of adaptive sports programs. He had already begun to make a name for himself after being featured in a film that became a viral sensation and premiered at Banff Centre Mountain Film Festival and Telluride Mountainfilm Festival, but after gaining a significant social media following, he realized that he wanted to use his platform to do more. He didn’t just want to create programs for people with disabilities to experience the outdoors, which was his role at Eagle Mount, but also to advocate for more inclusion of people of color in the outdoor industry. His passion and ability to make important connections has also led him to become the first adaptive athlete for The North Face, another platform for him to effect change. This desire led him to discussions with the Montana Racial Equity Project to further understand intersectionality—or the interconnectedness of social categorizations such as race, class, gender, disability, and socioeconomics—and the eventual creation of Earthtone OutsideMT, which works to elevate the visibility of Montana’s diverse outdoor enthusiasts by fostering a supportive and inclusive community for people of color. The group also engages in the community to help promote diversity, equity, and inclusion, which has predominately been focused on people who are white and those without disabilities. Sojitra has forged a unique career path and an identity connected to his passion, but he’s not simply content with having achieved this level of mastery. Rather, he is always searching for ways to reach out and expand the world around him. 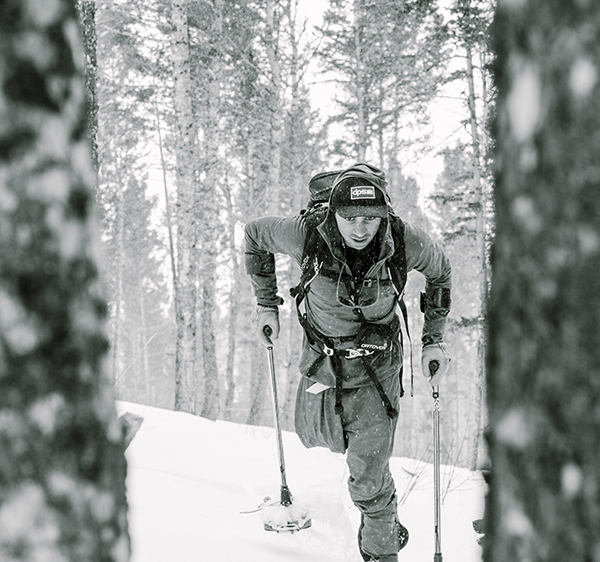 “Being able to combine my love for backcountry skiing while also empowering others and helping the outdoor industry become more inclusive gives me a greater sense of meaning and purpose,” he says. Like Sojitra, Eric Gabriel also discovered a purpose in his life after coping with amputation and its impact on his world. Gabriel grew up playing baseball in Long Island, New York, but as an adult his passion for competition turned to softball. He played in nighttime leagues around the island and in tournaments around the country on weekends, averaging 150 games a season. Eventually, he was forced to retire at the age of 36 due to injuries and resulting surgeries. Gabriel being fitted for a new prosthesis. Images courtesy of Eric Gabriel. Gabriel is now 61 and has had 60 orthopedic operations, including having his right leg amputated. In 2007, the “wheels came off of my career, educational quests, and life,” he says, referring to the time before his amputation. 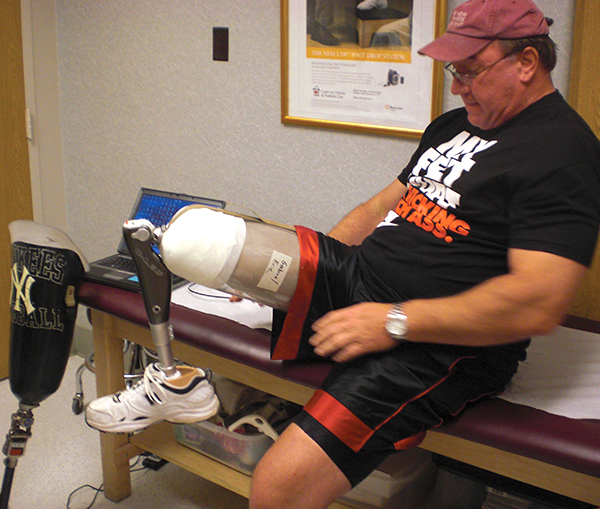 After dozens of previous right-knee surgeries, he consented to have a full knee replacement, but there were so many complications and additional surgeries following the replacement that by 2009 there was no choice left but to have his leg removed. Due to further problems, a ten-day scheduled stay in the hospital turned out to last four months. When he finally left Duke University Medical Center, he was more than ready to start his life afresh. Arriving home with nothing to do for a year, he realized he needed to get back in touch with his inner athlete. He discovered he enjoyed indoor rowing, and after training for about three weeks, he entered the World Indoor Rowing Championships (C.R.A.S.H.-B. ), which were being held in Boston the following month—February 2011. He aspired to compete in the adaptive division against other athletes missing lower limbs. His motivation was twofold: “First, I wanted to get my athletic identity back and experience the adrenaline rush again,” he says. “Second, I wanted to fulfill a promise I made myself when I was in the hospital to show people who had experienced an amputation that their lives weren’t over and could be exciting through physical exercise and competition in sports.” Much to his surprise, he not only accomplished this dream, he ended up in second place, winning the silver medal. Gabriel and his wife, Melissa, celebrating after the C.R.A.S.H.-B. event. All of this was in direct contrast to the low point he had reached leading up to and recovering from his amputation, and now he had renewed passion and purpose in his life. Today, Gabriel shares his passion for life by giving motivational speeches, and he has written about his experience in a forthcoming book titled Gabriel’s Row. As if that weren’t enough, Gabriel also has a passion for academics. During all his time traveling for softball in his earlier years, he became familiar with distance education, and now will receive his doctoral degree in organizational leadership from Grand Canyon University. His dissertation is on how preparatory exercise and competition in adaptive rowing influence the well-being of lower-leg amputee men at the World Indoor Rowing Championships. “I still work out and want to compete one more time at the C.R.A.S.H.-B., but I am trying to maintain that promise I made myself years ago in my hospital bed at Duke to show people with amputations that their lives are not over after limb loss. There’s so much more out there, so much more to experience, to do,” he says. This promise was meant to be fulfilled through his actions in physical exercise and adaptive sports; however, with his increasing age and mounting operations, his promise has now turned to academics and expanding knowledge and education regarding the barriers and opportunities in adaptive physical exercise and sports for people with disabilities. Editor’s note: At press time, Amplitude learned that Eric Gabriel had to have his remaining leg amputated due to infection. He is doing well and says he has big plans for the future. SLIDER and TOP IMAGE: Vasu Sojitra. Image by Seth Langbauer Photography.